DIMENSION: 100" Diagonal, 4:3 Ratio. SCREEN SIZE: 79.9"(W) x 60"(H). SCREEN MATERIAL: Matte White, 1.3 Gain, 160 degree viewing angle. GREAT EXPERIENCE: 3 layer backed screen which eliminates light penetration and produces top quality color reproduction with 25mm black masking borders to enhance picture contrast. AUTOMATIC W/ SWITCH OR REMOTE CONTROL OPERATION: Prewired power cord with integrated switch to regulate drop/rise settings OR radio frequency remote control for distant control. EASY USE: Easily installs to your wall or ceiling. 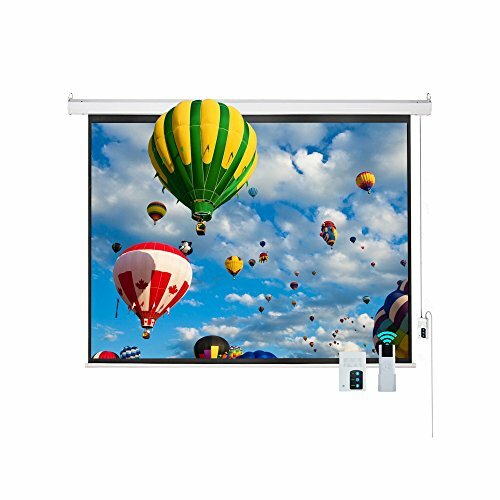 Ideal for home theater, public display, business, classroom etc.